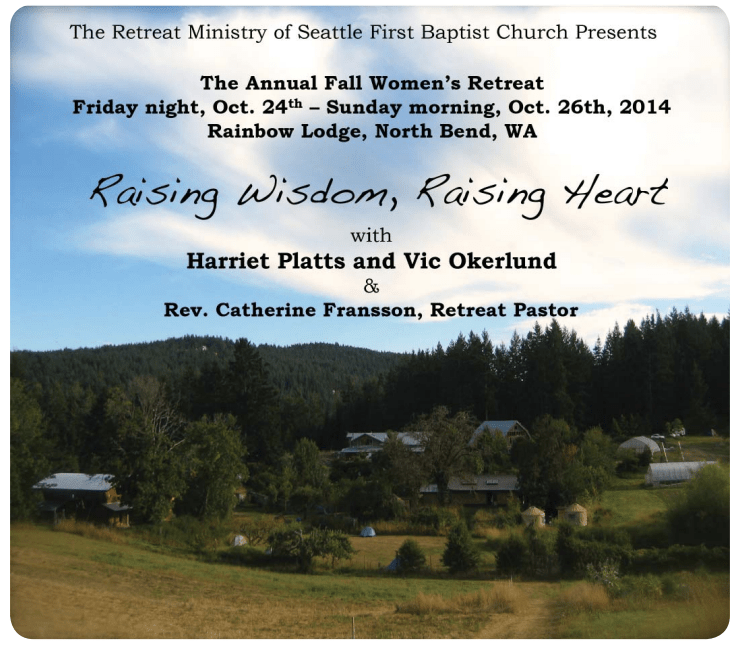 My friend and colleague, Vic Okerlund, and I are very excited to be joining you for the Fall Women’s Retreat, Raising Wisdom, Raising Heart! As 50 something-year-olds, we’re both immersed in the fullness of life, packing and sending kids off to college or life beyond our homes, nurturing our work lives, and trying to make meaningful contributions within the communities to which we belong. There’s also the ongoing maintenance of all the ‘stuff’ we’ve assigned as a necessity to living, trying to maintain semblance of a balanced inner life, caring for aging parents – friends, and then… wondering with curious hearts about how to care for the wellbeing of our fragile world with so many people suffering such accumulative, untold loss. Sound familiar?! Then…there’s the unexpected! We’ve all been blind-sided, surprised by experiences where we feel struck or toppled like the rug has been pulled from underneath us. “We thought we had plans in place,…that we had an understanding,…or we never expected our kid, partner, neighbor to do or say “that;” or the unexpected health challenge.” Living in relationship to the unexpected is inherent with being human. Sometimes we have no idea how to cope with the unexpected, but we naturally seek to know, to figure it out, and in time to make sense of it. Some find community and faith in God to be just what is needed to buoy them during these times. Others find help in many expressions of spiritual practices that ground and nurture the soul, resulting in deepened wisdom and a more compassionate heart. As we gather for this spiritual retreat, we aim to support new connections with others, deepening friendships, rest, communing in the Spirit and learning from one another. We will be reflecting on: What value is there in connection with a faith community when the bad breaks come? What spiritual resources – practices meaningfully sustain you? What’s sacred to you? In addition to lecture, discussion, and small groups, you will have time for art-making, solitude, a massage, and engagement with the natural beauty of the retreat setting at Rainbow Lodge. You don’t have to be directly connected to a faith community of any kind to participate. All earnest women seekers are welcome! Harriet continues to be curious about how people develop and nurture their spiritual lives. She enjoys making music with her voice and cultivating her relationship to the natural world. Vic is drawn to a place between the sacred and the secular where we all meet our growth edges and find ourselves awkward, in anticipation and often fragmented. She wonders what conversations could nurture our hearts and spirits in those places. One thing that grounds her is cycling in the Snoqualmie Valley where she is reminded of both the magnificent and ordinary. (Although she is looking at trucks in a new way). 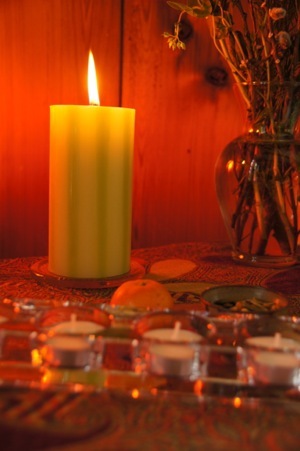 Categories: Events, Everything else, and Workshops & Retreats. Tags: life practice, ministry, Rest, and workshops. Even through all the sorting, releasing, and theological deconstructing of the last decade, I’m conserving the blessing of my ordination offered to me by the Crescent Hill Baptist Church community in Louisville, KY, 19 years ago, March 20th. This blessing was offered in faith, that I would continue along my path of conducting a free and responsible search for truth and meaning, encouraging me to love my self well, and to work compassionately in the pastoral care of others, with Jesus as an inspiration and teacher. Though I no longer call “Baptist” home, it is with a deep heart of gratitude that I continue to serve in a multifaith ministry role as a hospice chaplain, with my best intentions of embodying the “beacon of freedom’s light,” for all those I have the privilege of serving. May God bless you with the myriad colors of Her playful wisdom, teaching you to honor the best that is within you, and to carry the beacon of freedom’s light to Her people everywhere. Tags: ministry and pastoral care.